The sunken treasure remained little more than a local legend until the wreck was discovered in 1984, the first pirate ship wreck ever discovered in North America”. SOURCE: Wikipedia Commons. (Public Domain). 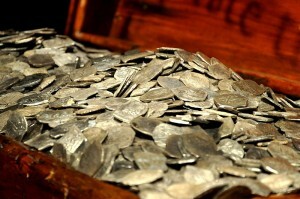 Image: “Real pirate treasure at the Houston Museum of Natural Science This is part of a special exhibit – “Real Pirates: The Untold Story of the Whydah Gally from Slave Ship to Pirate Ship.” . . . SOURCE Wikipedia Commons (This file is licensed under the Creative Commons Attribution 2.0 Generic license). Undersea explorers have discovered a trove of buried treasure that may lead to the discovery of more than 400,000 gold coins. 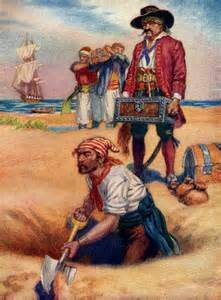 Barry Clifford and his team of archaeologists also found a musket and thousands of lead balls in the 18th century pirate ship they found off the coast of Cape Cod. KINGSTON, Jamaica (AP) — Archaeologists said Tuesday that they’ll ask the United Nations’ cultural agency to bestow world heritage status on Port Royal, the mostly submerged remains of a historic Jamaican port known as the “wickedest city on Earth” more than three centuries ago.Receiving the designation from UNESCO would place Port Royal in the company of global marvels such as Cambodia’s Angkor temple complex and India’s Taj Mahal.